Jennifer Aniston and Justin Theroux have made it official! The couple exchanged vows in front of more than 70 family members and friends on Wednesday at their Bel Air, California, home, sources confirm to PEOPLE. Reps for the couple did not immediately comment. For the celebration, a large wooden deck was set up in the couple's backyard, filled with cozy nooks for lounging as well as elegant seating arrangements for 74 festooned with low, casual ottomans. A raised stage on one end, and a bar on the other, flanked the intimate setup. Several of the stars' celebrity pals reportedly attended the party, including Lisa Kudrow, Chelsea Handler and Howard Stern. Party staffers were spotted bringing in a large cake topped with two puppet characters, and a man who appeared to be a pastor was seen arriving on the grounds, according to TMZ. Aniston, 45, and Theroux, 43, got engaged in August 2012 after more than a year of dating. In June, the Cake star opened up to PEOPLE about her fiancé of almost three years. "Justin was the best thing this decade," Aniston admits about her 40s. She also gushed about him in July 2014, saying, "He gets better every year." "He's just so beautiful and handsome to me," she said at a dinner honoring The Leftovers star. "He's just like a lost gem in the sand, and he's just always been there and been brilliant, and now this is just in a different light." Theroux was equally as smitten with his longtime love, calling her "gorgeous" as he promoted his HBO series last year and admitting that their approach to marriage involved anything but cold feet. "We have hot feet," he joked. As for Aniston's engagement ring, "I just think it's so beautiful," she told PEOPLE in June. "I've never had anything so big on my hand. But I love it because he picked it and put it into a setting and it's simple. It doesn't feel gaudy." The Friends star added that Theroux may switch up his own chunky gold ring – which currently spells out his name – now that he's a married man. "When we get married he will be wearing his ring. It just won't say Justin anymore," she said, adding that it may spell Jen "on the inside" instead. The couple first met on the set of Tropic Thunder in Hawaii in 2008. "We were friends for seven years. I replay when I met him then, but he wasn't a boyfriend," Aniston said. "It's funny to replay it because we weren't even anywhere in each other's realms of possibility." The twosome, who costarred in 2012's Wanderlust and were first romantically linked in May 2011, "both have the same work ethic and love to bounce ideas off each other," a source told PEOPLE in March 2014. "Jen seems more confident than ever, and they've become a great team." 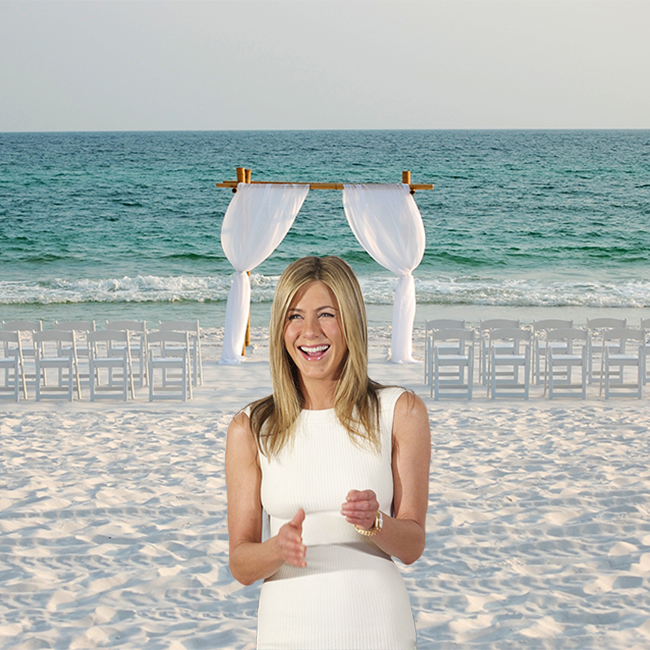 Added another insider: "It's amazing to see how happy Justin makes Jen."